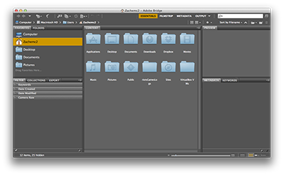 Adobe Bridge is a digital asset management app developed by Adobe Systems and first released with Adobe Creative Suite v2. It is a mandatory component of Adobe Creative Suite, Adobe eLearning Suite, Adobe Technical Communication Suite and Adobe Photoshop CS2 through CS6. Starting with Creative Cloud, however, it has become an optional component downloaded via Creative Cloud subscription. Bridge can help organize files by renaming a group of them at once, assigning colored labels or star ratings, edit embedded or associated XMP and IPTC Information Interchange Model metadata and sort or categorize them based on their metadata. 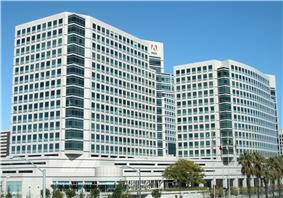 It can work with different versions of a file that is part of an Adobe Version Cue project. However, it lacks the photo editing functions of Adobe Photoshop Lightroom. Image files can be shown in different sized thumbnails, slide shows or lists. Each folder, which can be bookmarked, has a cache file for speeding up rendering time of images when viewing a thumbnail. The cache can be in one central location or in individual folders. Adobe Bridge can be invoked from within all components of Creative Suite except Adobe Acrobat. Coupled with Adobe Photoshop, Bridge can execute Photoshop's compatible automation plug-ins, scripts and Adobe Camera Raw filters on a group of images. A plugin for Photoshop called Mini Bridge adds a small file browser to Photoshop, although Mini Bridge can be used only if Adobe Bridge is running in the background. Adobe Bridge initially allowed for access to Adobe Stock Photos, an online collection of stock photography images drawn from well-known stock photo houses. The service was discontinued on April 1, 2008. 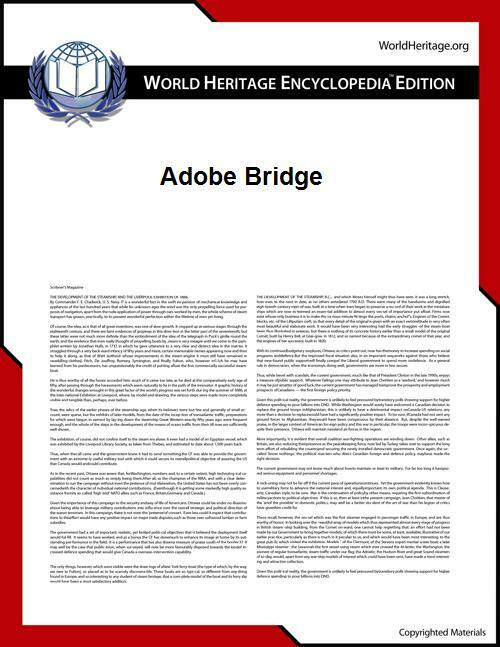 ^ "Adobe Bridge included with the stand-alone Adobe Photoshop". Archived from the original on 22 February 2008. Retrieved 2008-02-29. ^ "The cache in Adobe Bridge". Archived from the original on 5 April 2008. Retrieved 2008-02-29. ^ "Adobe Bridge is not included with the standalone version of Adobe Acrobat 8". Archived from the original on 22 February 2008. Retrieved 2008-02-29. ^ "Adobe Stock Photos". Retrieved 2008-02-29. ^ "The Adobe Stock Photos service was discontinued by Adobe on April 1st, 2008". Archived from the original on 11 June 2008. Retrieved 2008-05-16.